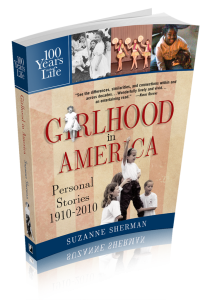 100 Years in the Life gives a taste of the times one decade after the next with personal perspectives that tell a story like history books never can. The coming of age years are transition years between childhood and womanhood. We’ve all done it and we’ve done it differently in every decade. The culture of the teenager really took off in the second half of the century, and this book will show what happened on both sides of the 1950s—real stories by the teenagers who were there. The personal story—lived experience—showcases history like history books never can. The experience of womanhood in American culture is much more than the newsworthy events: Gaining the right to vote in 1920, entering the workforce during World War II, exploring new kinds of emancipation in the 1960s and 1970s. The dramatic changes for women across the 20th century and into the 21st century will reveal enlightening truths. And you can be a part of it. Did you know you can submit your own story for any of these books and be a part of 100 Years in the Life? You don’t need to be a writer, you just need a good story to tell.